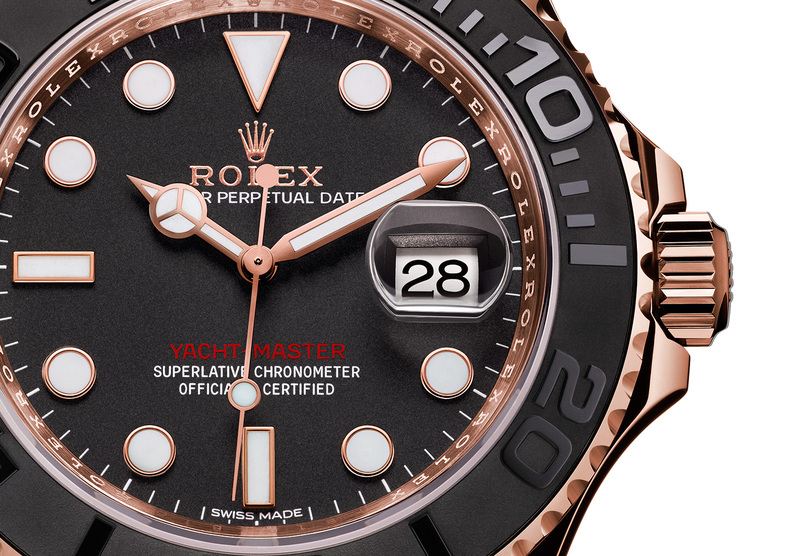 The brand new Yacht-Master combines Everose gold with a black ceramic bezel insert, red lettering on the dial, and the first ever rubber strap from Rolex, the Oysterflex. 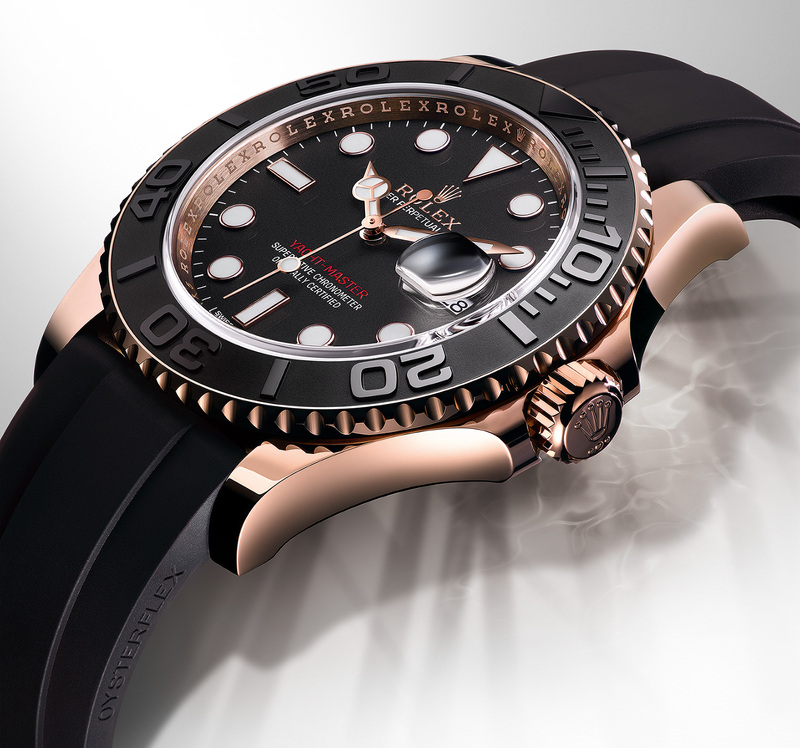 Long the most luxe of Rolex‘s marine sports watches, the quintessential Yacht-Master is in solid gold. 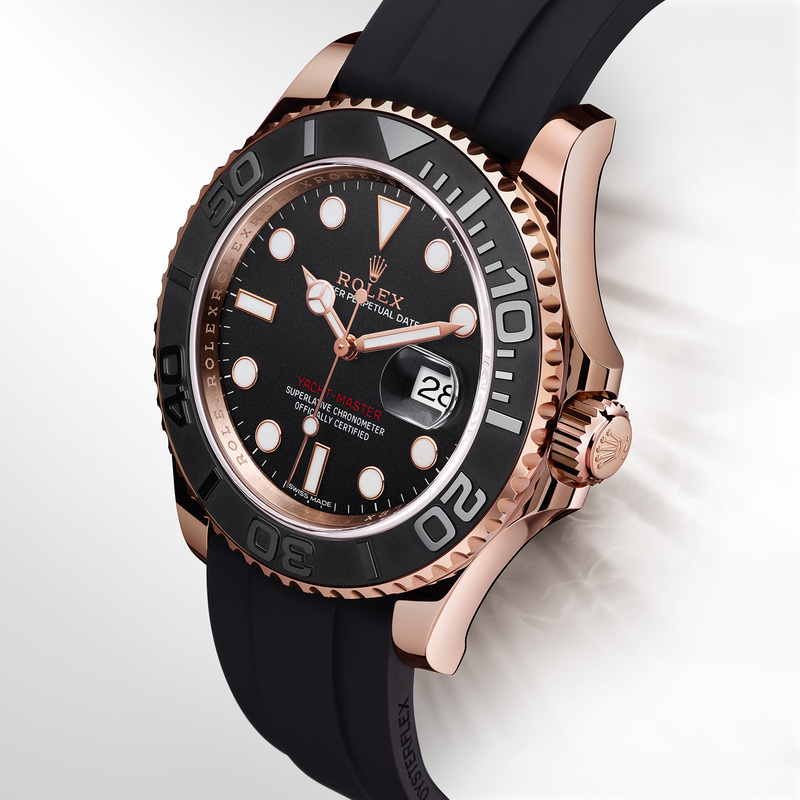 Likely the first of a refreshed Yacht-Master line-up, the new Yacht-Master Everose unveiled at Baselworld 2015 is notable for its aesthetics and integrated rubber strap dubbed the Oysterflex. 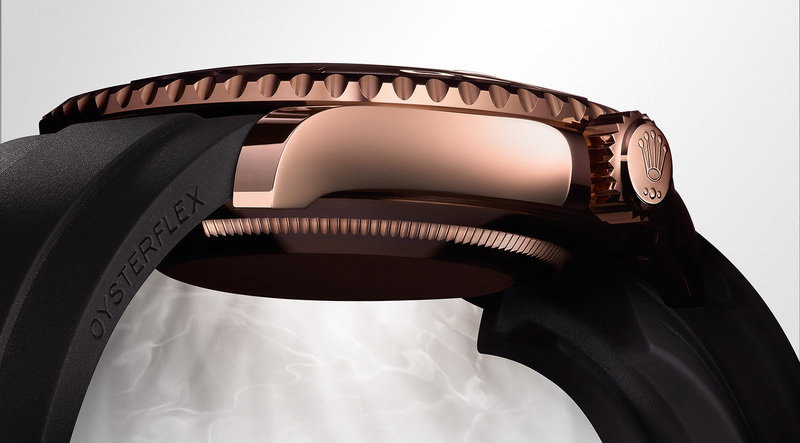 The case (available in 40 mm and 37 mm) is Everose, the proprietary rose gold alloy developed by Rolex that’s resistant to fading, while the bezel is a matte black Cerachrom. 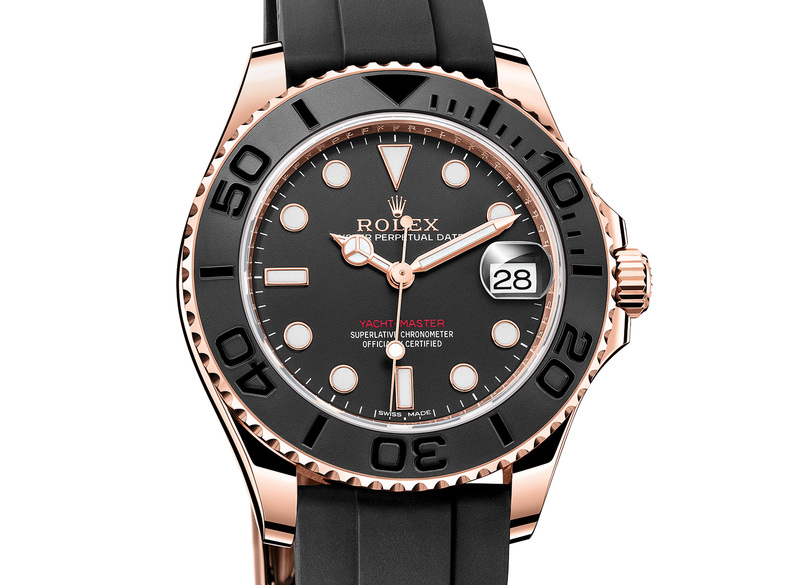 Unlike other ceramic used by Rolex, this has polished, raised numerals and markings against a matte base. The typical Rolex bezel, on the other hand, is inverted, with engraved, matte markings on a glossy base. 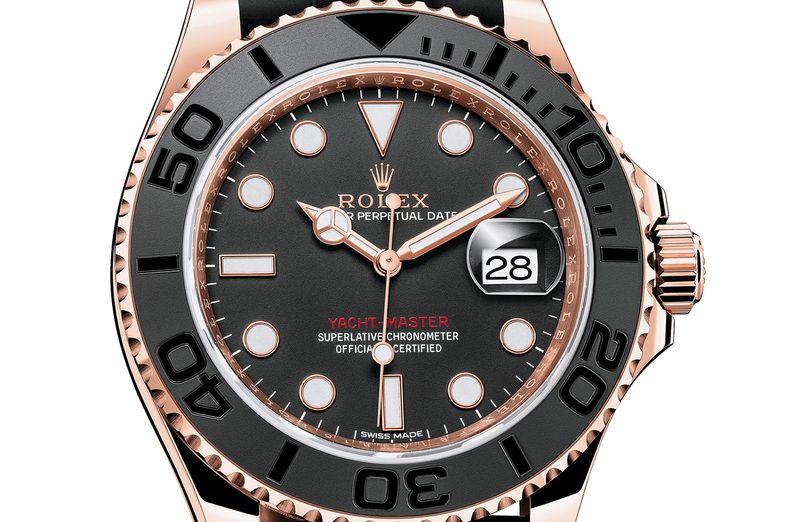 For the first time ever in a Yacht-Master the dial is black, with the Rolex logo in gold, along with the model name in red. It’s certainly no accident that the dial is vaguely reminiscent of vintage Rolex sports watches, with the red lettering dive watches of the seventies like the Red Sub and Double Red Sea-Dweller, while the gold logo brings to mind gilt dials. 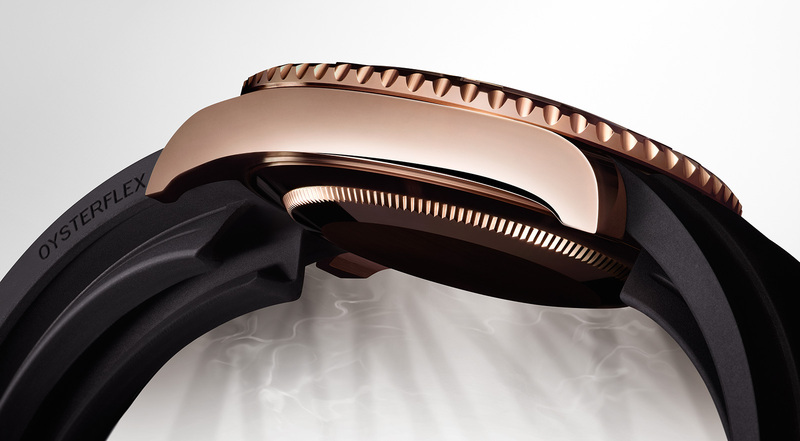 Patented by Rolex, the Oysterflex bracelet is a synthetic rubber strap with a rose gold folding clasp – making it similar to several aftermarket rubber straps made for Rolex that have been available for several years. Underneath the black rubber is a titanium and nickel alloy blade that gives it flexibility and strength. The inside of the strap is moulded with a “patented longitudinal cushion system” that keeps the watch sitting stably on the wrist. This bracelet will certainly find its way to other models in upcoming Baselworlds. The larger 40 mm Yacht-Master Everose is equipped with the calibre 3135, while the smaller model has the calibre 2236 inside. Both are automatic, and the calibre 2236 is fitted with the Syloxi silicon hairspring that made its debut last year. This will cost 23,800 Swiss francs for the 40 mm model (ref. 116655) and 21,000 Swiss francs for the 37 mm version (ref. 268655).